1. Preheat oven to 200°C/180°C fan-forced. Grease a 10-cup-capacity casserole dish with 20g butter. 2. Place lamb in a large snap-lock bag. Add flour. Shake to coat. Remove lamb from bag, shaking off any excess flour. Heat oil and remaining butter in a large, deep frying pan. Add ½ the lamb. Cook for 5 minutes or until browned all over. Transfer to a bowl. Repeat with remaining lamb. 3. Add onion and carrot to pan. Cook for 5 minutes or until onion has softened. Return lamb with stock, worcestershire sauce and thyme. Bring to the boil. Remove from heat. 4. Meanwhile, arrange ¹⁄³of the potato slices over base of prepared dish. 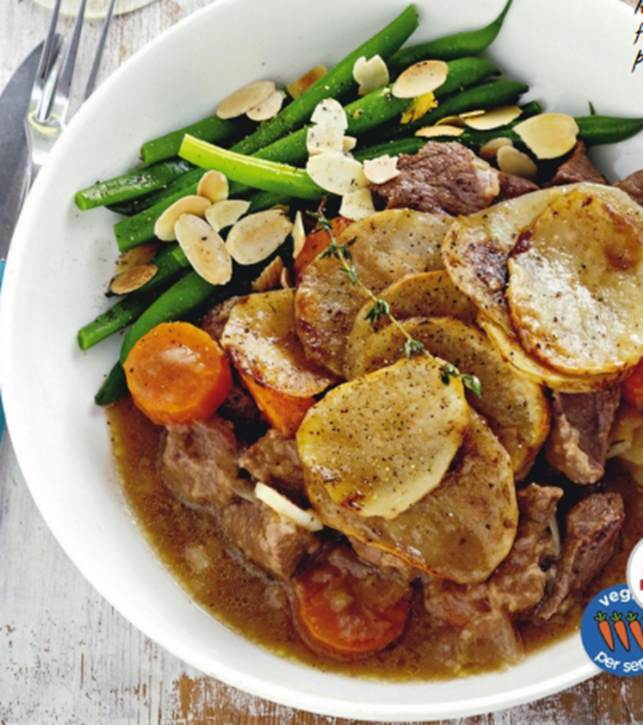 Spoon lamb mixture into dish over potato. Arrange remaining potato slices over top in an overlapping pattern. Season with salt and pepper. Cover dish with baking paper, then foil. Bake for 1 hour. Remove from oven. Remove foil and baking paper. Bake for a further 35 minutes or until potato topping is golden and lamb is tender. 5. Place almonds in a frying pan over medium heat. Cook, stirring, for 2 minutes or until lightly toasted. Transfer to a plate. Cook beans in a saucepan of boiling water for 2 minutes or until bright green and tender. Drain well. Place beans in a serving dish. Drizzle with oil and sprinkle with almonds. Serve with hotpot. · Nutrition:(per serve) 2745kJ; 37.2g fat; 11.5g sat fat; 48.3g protein; 28.6g carbs; 8.1g fibre; 161mg chol; 738mg sodium.